I’d like to make an excuse or two for my behaviour. After all I’m very pregnant and don’t move as well as I used to. However, I know that no matter what I say, all I have is an excuse. There is no justifiable reason why I did what I did. What I did was wrong. It was mean. It was a panicked effort to try to make the girls do what I wanted them to do. The initial problem is my guilt. Moving has become increasingly difficult the past few weeks and I’m not playing with the girls the way I used to, and definitely not the way they want me to. I have a big belly, and they’re aware of that. They both do what they can to be gentle and watch out for their growing brother or sister, but at 2.5 and 4 sometimes they forget to slow down before leaping into my arms. Our day starts out pretty basic, but as soon as the girls want me to do something I can’t, they head down and turn on shows. Agatha will come back upstairs and join me in whatever I’m doing – usually cleaning of some sort. Or she’ll grab a book and ask me to read to her. I can do that – so I do. Sometimes she’ll turn on the computer and play games, or ask for the ipod or explorer. It all depends on her mood. Ella, on the other hand, will stay downstairs and watch shows all day long. She doesn’t venture back upstairs unless she has to. If I go downstairs to do something, she’ll join me. If I’m cleaning up their toys, she’ll come over and either help or start playing with something and ask me to join in. It’s not easy sitting on the floor, but I do accept her invitation for at least fifteen minutes – longer if there isn’t too much pain. But ultimately she’s in front of the TV most days for the majority of the day. Of course I said “Yes.” My plan was working. I met her in her space and I was more important than the TV. That’s a pretty amazing feeling. So we played a Bopping game for a while, then it morphed into a magic game, then into something else. All total we played for over an hour where she was physically active – with me. It was great. “Okay, but when you’re done, turn off the TV because after we eat it’s time for bed.” Agatha and I went upstairs on our own. A few moments later Ella joined us. As they ate, I realized that the Explorer was covered in some sort of slimy goo, and the game cartridge was missing. No one knew where it was. I was upset and instantly started lecturing Agatha (like that would do any good!). But Ella stepped in and said she’s the one who removed the game, not Agatha. She didn’t remember where she took it out, or where she left it. It’s her game, her system, so why I got so upset is beyond me. I started yelling. I said if she didn’t find the game then there would be no more TV, no more computer, no more ipod, and definitely no more explorer. In order to use the toys she needed to show she could be responsible and respectful of the items. She started crying. And of course hurting her like that wasn’t enough. I then went into a rant about how messy her blanket was, and she couldn’t use it that night, she needed to find something different. Yes, the blanket was dirty, but all of the bedding is due for a wash, so did it really matter if she used it one more night, and then had it washed during the day tomorrow? I behaved poorly. I put items higher on the priority list than my dear Baby Girl. I’m sure many of you might read this and think I did the ‘right’ thing. If she can’t take care of her toys, then she shouldn’t get to have them. However by taking away her toys I prevent her learning how to take care of them. Also the explorer, ipod, TV, and computers are all different. She misplaced the explorer game, she did not damage the TV, or anything else for that matter. Luckily, I realized this and back tracked. I apologized for what I said, and told her the other items were not taken away, but that she still couldn’t use the explorer until the game was found. She cried and told me how upset she was, it’s so special to her, because she got it as a present. I hugged her and assured her I would help her find the game in the morning, but also let her know that I hoped she’d take better care of her toys in the future so this doesn’t happen. That was a better approach, but I still missed one very important thing. I focused on the game, not her. The game wasn’t in the machine, but I never once asked her why. I automatically jumped to our ‘rule’ that if the game was taken out it needed to be put into the case – that is kept in a cupboard the girls can’t reach. She’d taken the game out, because Agatha kept pulling it out and leaving it on the floor. So Ella took the game, and put it somewhere safe so that it wouldn’t get broken, but so she could still play it when it was her turn on the explorer. Even though I negated some of the damage my yelling and punishing did, bedtime was difficult. 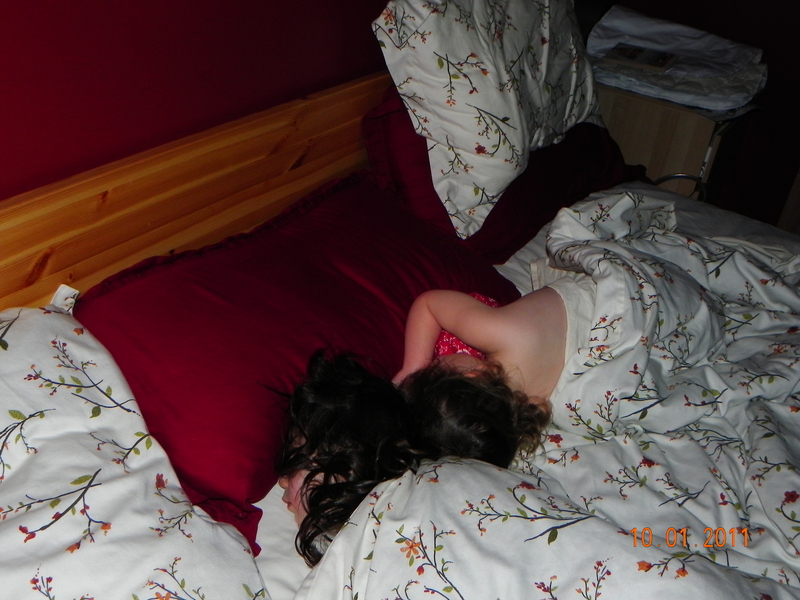 The girls were both well beyond tired and that lead to fighting. Ella just wanted to lie down ready to listen to the story, Agatha kept Roaring at her. Ella cried, screamed, and Agatha did it more. I started to scream again. For some reason my brain seemed to think that screaming at them to be quiet would actually help. Again, I realized my mistake, turned and walked out of the room. I stayed out until the urge to do anything drastic passed, then I walked back in – all ready for bed. Agatha was still roaring, so I ignored her. I cuddled Ella, her needs seemed to be more pressing. We talked about how she was feeling so tired and how I was concerned she might have chosen to watch too many shows that night. We talked, both expressing our views. I let her know I wouldn’t make her stop watching shows, but I didn’t think it was a good idea to watch them if she was left feeling sad or angry in the end. She nodded and asked to read the story. Just as Agatha was about to drift off to sleep, she reached up, hugged me, lifted my shirt and kissed my belly, then promptly fell over asleep. It was a rough night, but it could have been so much worse. By realizing I was the one error I was able to change what I was saying and doing and prevent so much heartache. Nothing is worse then watching my little girls fall asleep with frowns on their faces.